I love a versatile item, don’t you? In modern homes it’s a real bonus if an item can look good, add character and serve a function. Some collectibles can only really be used for one purpose, but others can be repurposed into a variety of uses that suit your particular needs. Here are my top three versatile, charming, and often inexpensive items that can be used in creative and fun ways throughout your home. I’ve found all these items at antique shows, flea markets and shops over the years and I’m still discovering new uses for them. Jars – Ah the humble, hard working jar. New jars are nice, but real vintage jars are still an easy find. I love them for their imperfections and old fashioned marks. My favourite has a soft blue colour that is timeless and pretty. Old jars just say “country home” and fit in many relaxed styles. Bathroom Storage – Q-tips, cotton balls and bath salts look lovely and stay protected. Succulent Terrariums – Small trees and fake snow make fun holiday decorations as well. Vases – An old fashioned way to display your fresh cut flowers. Lights – On the easy end, you can put a candle or string lights in a jar to great effect, or if you feel crafty, there are great directions out there for turning jars into table lamps and even chandeliers. Vintage “GEM” jar with garden peonies. A dollar store grid top made this jar a vase. Tins – Graphic, fun, functional tins. Keep your eyes peeled and you’re sure to find something you like at a wide variety of markets. Collectors prize certain brands (and clean condition), so price will vary. Desk & Kitchen Organizers – One of the easiest ways to enjoy a tin is simply take the top off and fill it with something you need to have out on a surface, like pens or cooking utensils. Big tins can hold bags of flour or pet food. Glue magnets to small tins and you can use them on your fridge. Vintage “Girl Scout” tin. Purchased at the Nashville Flea Market, this tin is both a great souvenir and a handy way to corral my pens. I love the badges! Planters – Fill a tin with dirt and plant something that won’t require much water, like a succulent. Easy to grow and display. Candles – Wax, wick, you’re good to go! Jewelry – Difficult for beginners but if you know how to work with metal, small pieces of cut antique tin can inspire wonderful designs. Also a great use of otherwise very damaged and inexpensive tins. Caddies – With a little effort, you can turn multiple tins into a tiered caddie for your office or craft room. Corbels and Trim – A corbel (also sometimes called a bracket) is the piece of wood, usually carved in a decorative pattern, that sticks out and holds up the structure above it. Trim is simply any piece of wood that was once used to outline a piece of furniture or structure. Kitchen Counters & Cabinets – Mounted underneath counters and cabinets, corbels can add texture and nostalgia to modern kitchens. My DIY antique trim coat hook. Still holding up our coats in style! 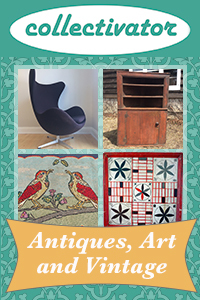 I hope this encourages you to find spots for these charming old items in your home. Do you have any more ideas for using jars, tins or trim? Please share in the comments below!